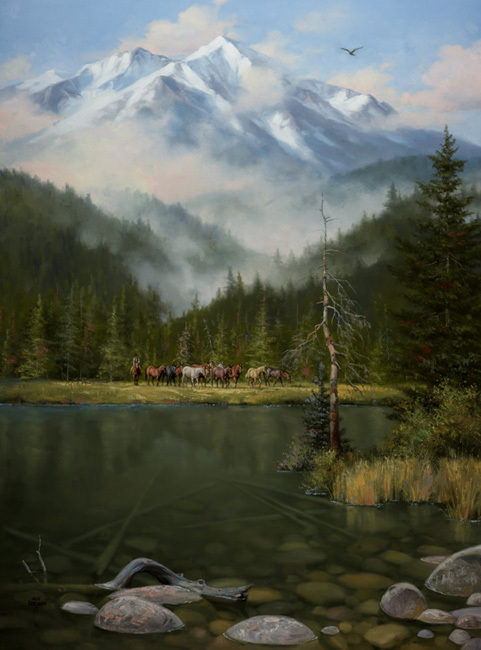 Jack Sorenson: Texas artist Jack Sorenson has spent his entire life on and around horses, a fact which has contributed tremendously to his authentic depiction of these magnificent creatures. 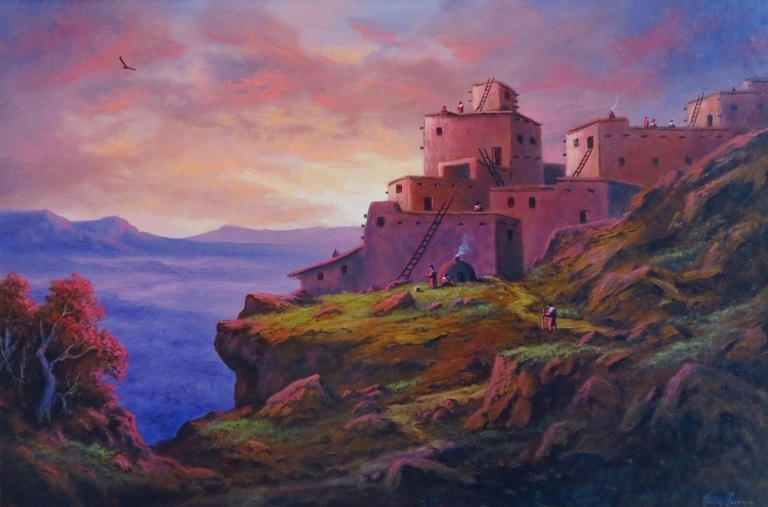 Attention to detail and strong story-lines also characterize his work. 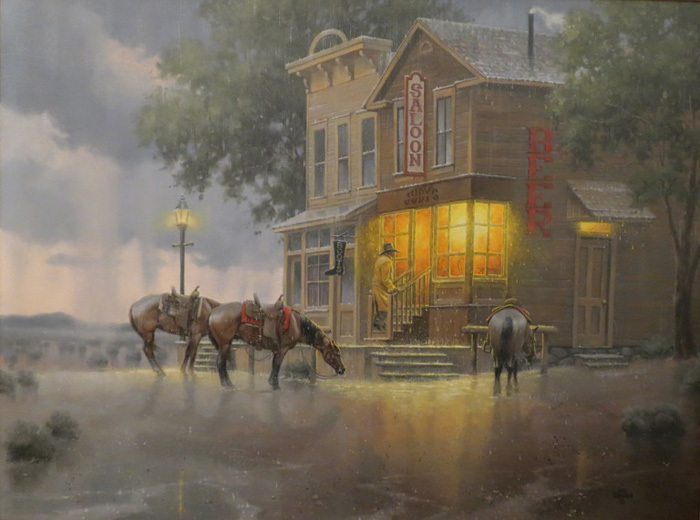 Sorenson grew up living the scenes of the Wild West that he now paints. As a kid on his father’s dude ranch and frontier town on the rim of Palo Duro Canyon, his various jobs included gunfighter and stagecoach driver. Later, he moved on to breaking horses, which he continued to do after his marriage and while he began to paint more seriously. “I’ve known all my life that I was going to be an artist,” he says. “It’s like a preacher being called – it’s what I’m supposed to do.” After his first one-man show sold out, Sorenson opted for painting full time. 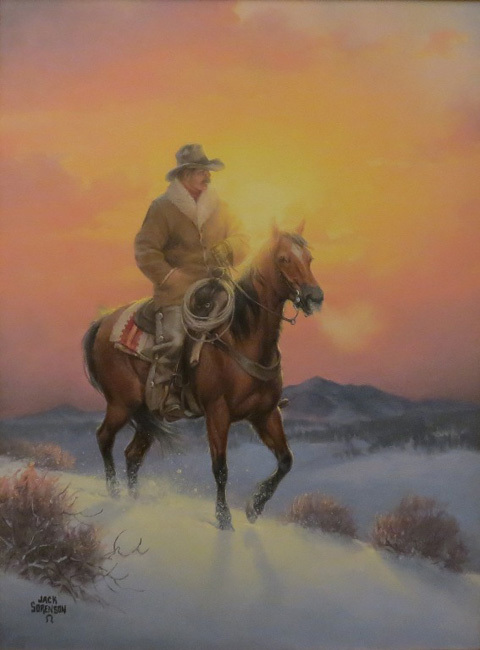 Jack Sorenson has been a professional artist for over forty years and his paintings have been used as covers for more than a dozen Western magazines. 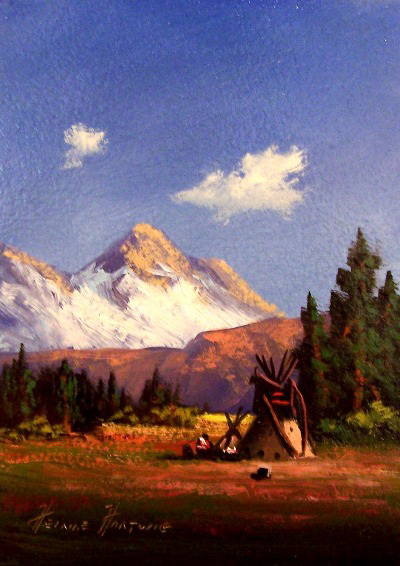 He is one of the best-selling artists for Leanin’ Tree Christmas & Greeting Cards. 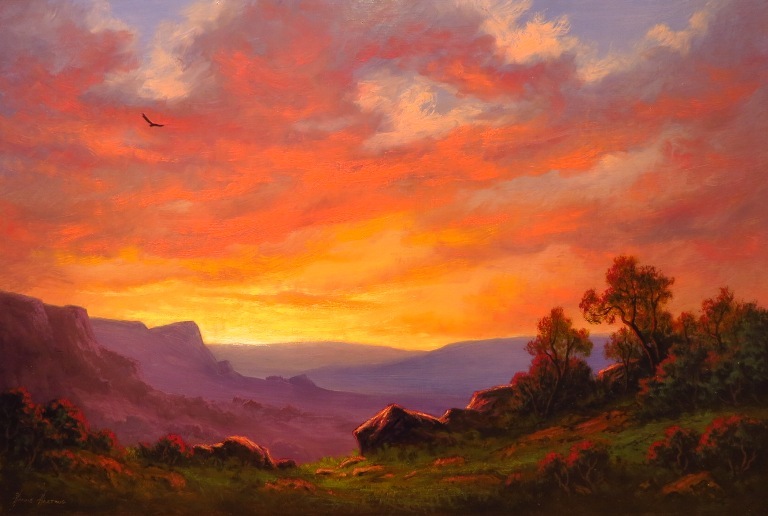 Warner Brothers recently used Sorenson’s painting of the Palo Duro Canyon as the cover of The Log of a Cowboy, an audio literature cassette by Michael Martin Murphey. 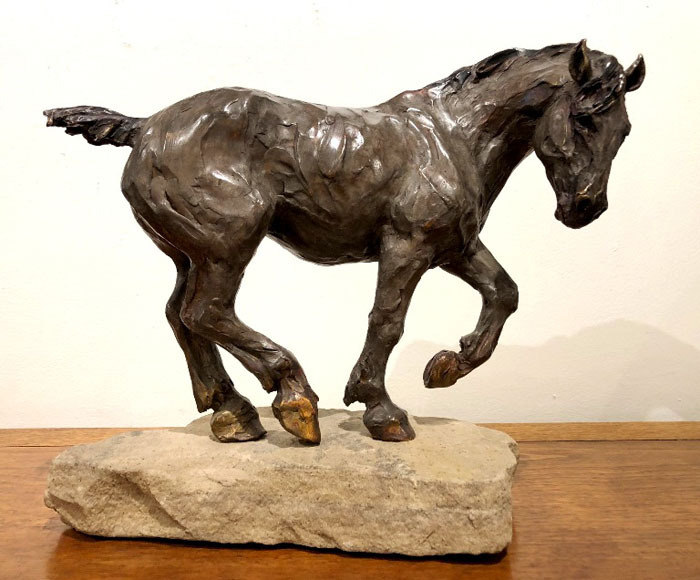 Robin Laws: “Quietly striking” is how James Mills, Arts Editor of the Denver Post, described artist Robin J. Laws’ work. This powerful theme echoes through the high plains of Northeastern Colorado where Laws was born and raised. 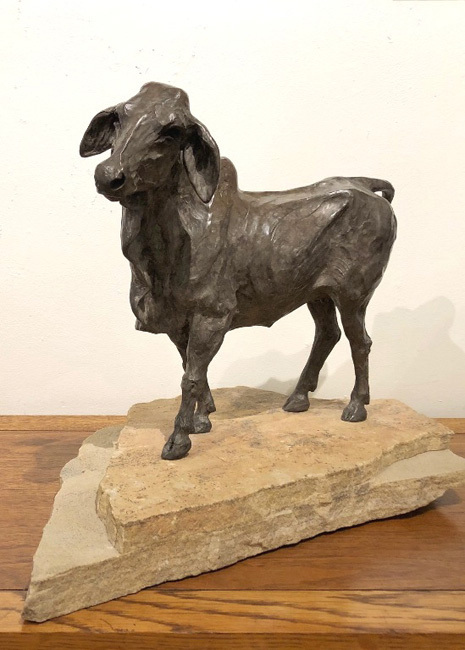 From childhood, in a two-room schoolhouse in Woodrow, Colorado, she has sought to convey her world, its rural surroundings and lifestyle through art. 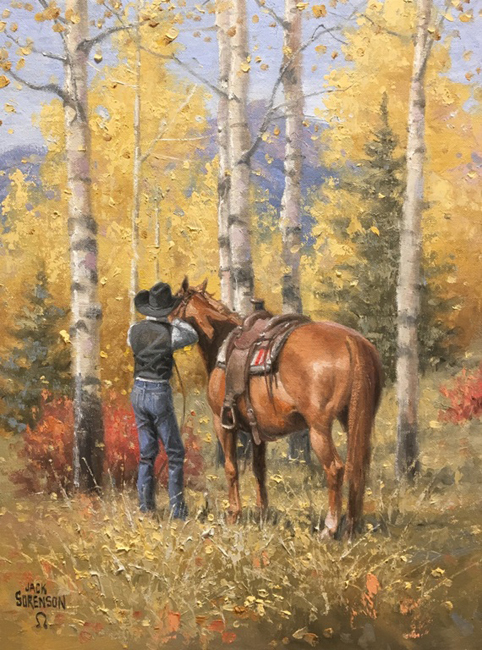 Her talent has been honed over the years by attending workshops, seminars, and classes including the Scottsdale Artist School, Cowboy Artists of America workshops, and the Foothills Art Center. 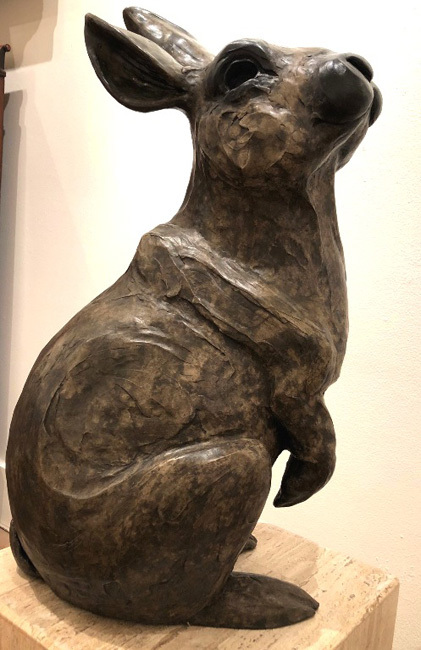 Laws’ art remains focused on her original intent- accurately portraying the spirit and personality of each of her subjects- particularly her animals. 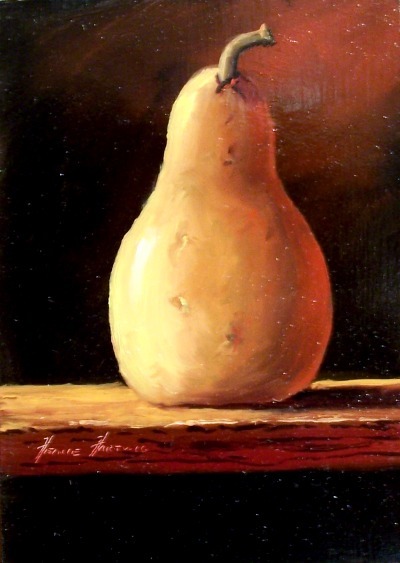 Working with live farm animals as models creates a challenge for the artist- but it is one that she relishes. 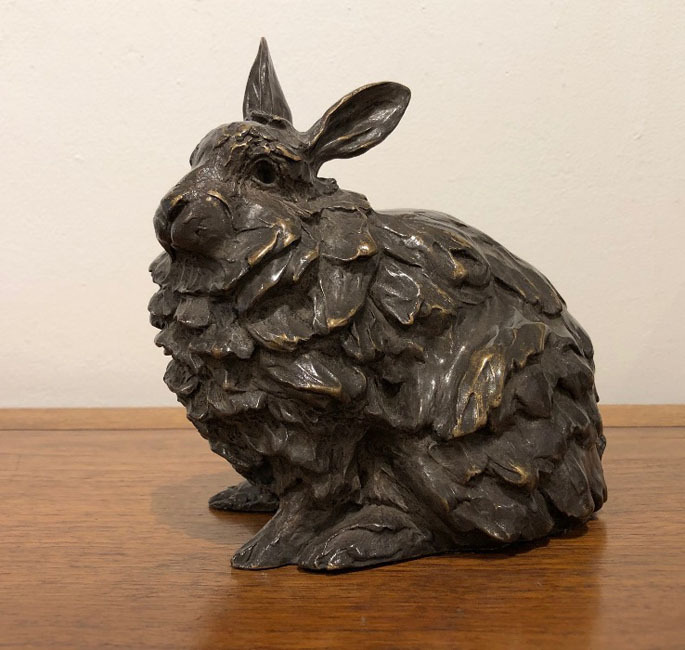 Laws utilizes the bronze medium as a lasting tribute to the animals she knows- they are friends, companions, and co-workers. 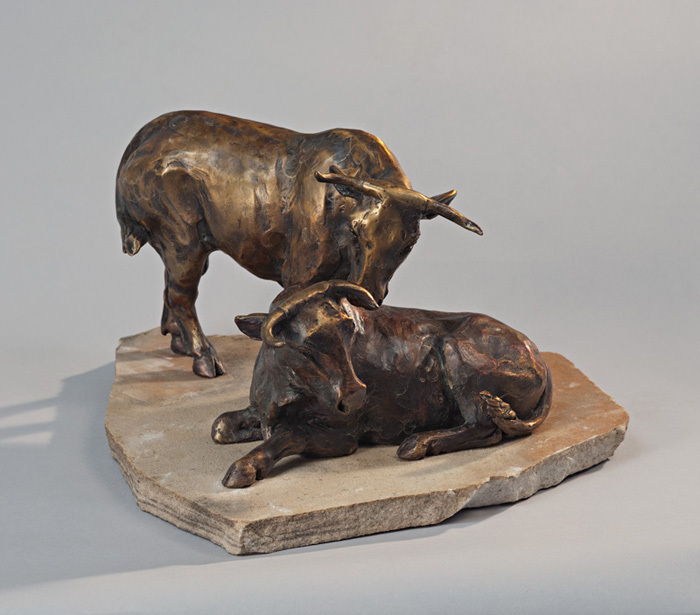 Her bronzes speak to the uniquely western American experience and rural life in particular. 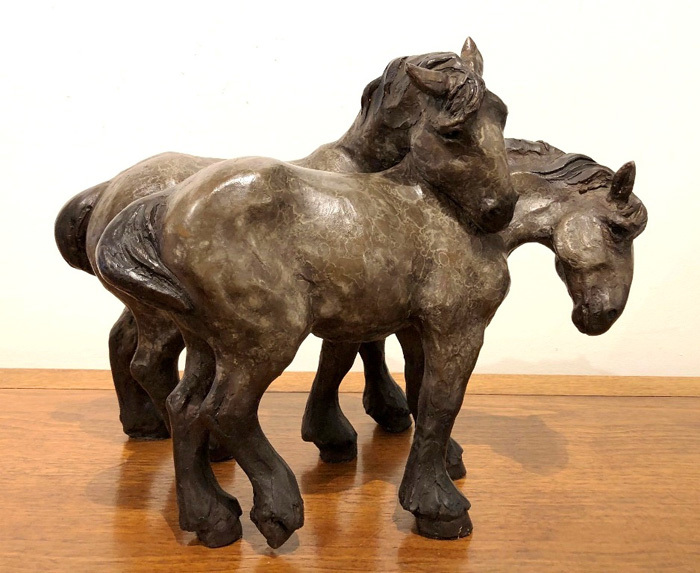 Robin has many awards, exhibitions, and shows to her credit, including Ducks Unlimited Artist of the Year for the State of Colorado, The Ann Hyatt Huntington Award for sculpture, Best of Show honors at the Buffalo Bill Museum Show, the American Women Artists Annual Invitational Show, and the National Equine Society Art Show. 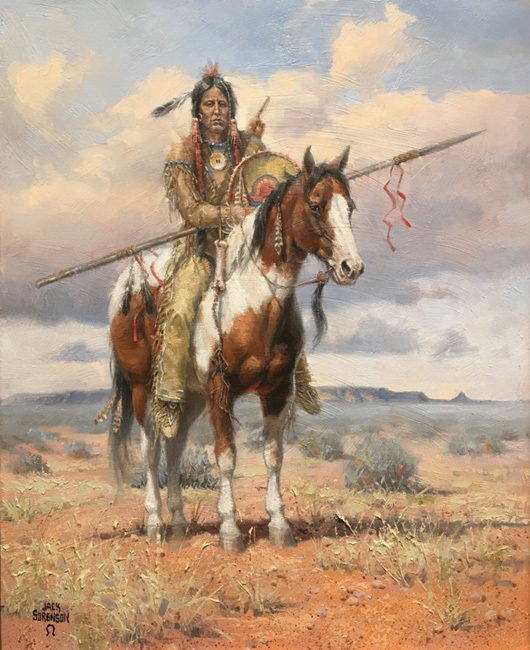 Her work has been exhibited by The National Arts Club and The Salmagundi Club, the Cowboy Artists of America Museum in Kerrville, Texas, the Museum of Western Art in Denver, Colorado, Cheyenne Frontier Days Old West Museum in Cheyenne, Wyoming, The Society of Western Artists Exhibition in Oakland, California, the American Women Artists Annual Invitational Show, and Italy’s famed international exhibition- The Biennale Invitational. Laws’ works are included in many private, public, and corporate collections, including the Colorado School of Mines, Golden, Colorado, Fairplay High School, Fairplay, Colorado, the Leigh Yawkey Woodson Art Museum, Wausau, Wisconsin, The City of Cheyenne, in Wyoming and at Osborne House in Warsash, England- home to the personal physician to Prince Charles and Princess Diana for ten years. When she’s not painting or sculpting, Laws enjoys participating in local cattle roundups each spring and fall. She says the experience helps her see the world and herself more clearly. 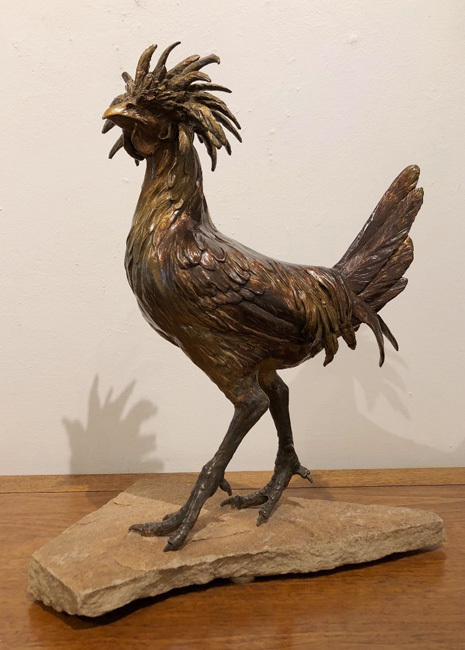 She is also very active in her community, serving as artist in residence for local schools, providing programs for nursing homes and helping to organize art shows, including Colorado’s Finest Art show which is hosted by the governor of Colorado. In addition to her time, Laws has donated numerous works to auctions to benefit local, state, and international non-profit organizations. Heinie Hartwig: Heinie Hartwig spent many years studying the great masters and invested much of his time experimenting with their techniques. Through this Hartwig became convinced that strength, durability and long lasting sharpness of color are created with the use of “Old World” color formulas. The overall results of his experimentation and training have led to numerous commendations and awards, including the prestigious Triton Museum Competition. 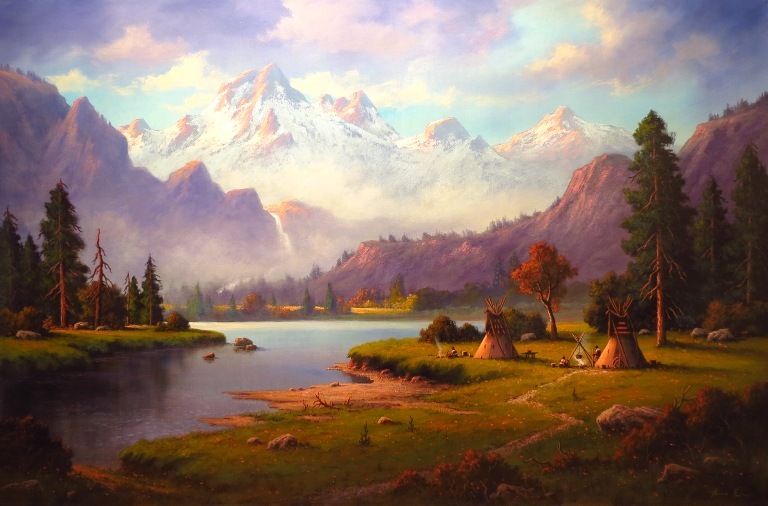 Hartwig’s works are proudly displayed in such venerated institutions as Brigham Young University, Mills College, The Robert Louis Stevenson School and the Monterey Institute of Foreign Studies. 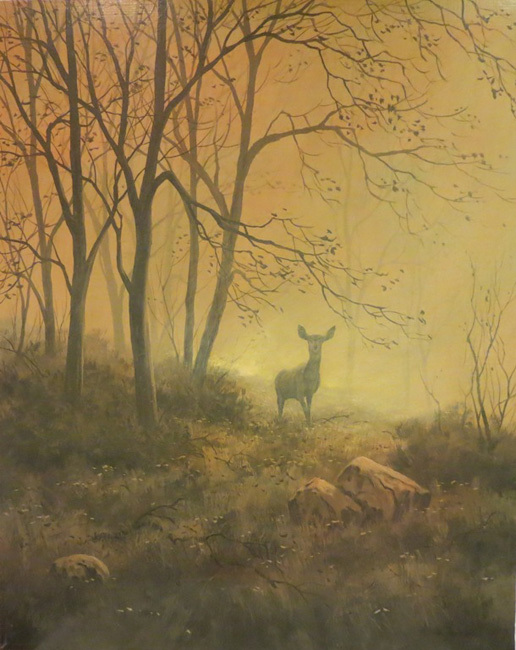 Many paintings by Heinie Hartwig are sought after by international collectors.